It’s been a while since I’ve mentioned anything about my book making pursuits but that’s because I haven’t been spending a lot of time in the studio these past several weeks. Now that I’m starting to feel better though I’m ready to get back to it. I’ve even started sewing some text blocks so hopefully I will have some new books to share soon. 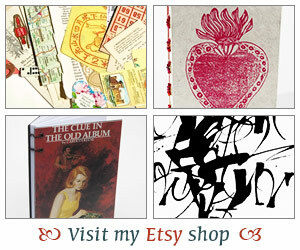 In the meantime though I want to invite you to visit the Bookbinding Etsy Street Team blog. Aside from having such great information on bookbinding and the many Etsy book artists, I was just interviewed! Thank you to Hilke from Büchertiger’s Book Shop for the great interview. Enjoy! I’m looking forward to going to the library this weekend and also hopefully stopping by the bookstore as I want to see Playing With Books by Jason Thompson. I get the feeling that’s another book for my books on bookbinding collection. Anyway, hope you all have a wonderful weekend and more bookish talk soon. Edited to add: I can’t believe I almost forgot about the 24 Hour Read-A-Thon! To those of you participating, have tons of fun. I couldn’t join in this time but looking forward to hearing how you all do. How cool! I actually blogged about a project my students turned in today and was thinking of binding the pages they have created but had no idea where to start. I will definitely check it out. jrav – I just saw your students’ project, loved it! Most turned in one page, front and back, I’m assuming? Unfortunately because you don’t have the extra space on the left hand side page then any binding would cover up some of the art. If you don’t mind that, then I’d suggest something like a Japanese stab binding (you can google that and find some simple designs). Otherwise I guess you may only be left with a spiral bound or adding the pages to a three ring binder and maybe doing up a neat cover for it. Anyway would love to see if you come up with something for it so keep us posted! Thanks for the suggestions. Only a couple did front and back so I was thinking I could add maybe a 1-inch heavy paper to the left edge and use that to bind. I’ll look up the Japanese stab binding. I’d really like to be able to keep these from semester to semester. More will come in next week, so I’ll update as I go. I am glad you are starting to feel better, Iliana. Thank you for sharing the interview with us! Enjoy your weekend, Iliana. I hope you start feeling better. Have a great weekend. I’ll be reading and cheering. The interview was FAB! I loved it. Glad to know that you are better. How cool that you’ve been interviewed-I’ll go read it when I finish here. And I miss my needlework when I am too busy with other things. Glad to hear you’re feeling better and can get back to your books! Glad you’re feeling better and the interview is great 🙂 You look so cute in the pic! You do fabulous work. I loved the article – your haircut looks really cute! I hope you are having fun getting back to your bookmaking and had a wonderful weekend. Literary Feline -Thank you! I had a good weekend, just relaxing and going to the library. Hope you had a good one too! Savvy Verse & Wit – Thanks Serena! I didn’t get a chance to cheer along but I am looking forward to catching up on post-read-a-thon posts. I bet everyone had a great time! Danielle – I was pretty excited when I found out 🙂 I’ve been missing my bookbinding so it’s so nice to get back to it! Loved the interview Iliana! It was nice reading about what inspired your adventrues into bookbinding! Great interview! You do some great work, and it looks like a lot of fun.